Can't find the answer you're looking for? Contact us or call 1300 848 302. Enrolment is easy! You can enrol online with our ‘Find a Course’ link that’s located on every page - all you need to do is simply choose a location and date. Alternatively, you can make a booking by calling us directly on 1300 848 302. How is the Nationally Recognised course different to the Short course? Both the Nationally Recognised and Short Course are delivered in a face-to-face training session over 1 day. However, the major difference between them is that the Nationally Recognised Course has an additional self-paced OHS (Occupational Health and Safety) online component and is thereby considered a higher qualification. The course you decide on will largely depend on your particular needs. To choose the course that fits your needs the best, simply go to Choosing the Right Course. The course consists of 1 day of face-to-face training, starting from 8:00am and finishing at approximately 4:30pm. If you’re planning on doing the Nationally Recognised course, it’ll consist of an additional self-paced OHS online component, which is to be completed in your own time before the course. 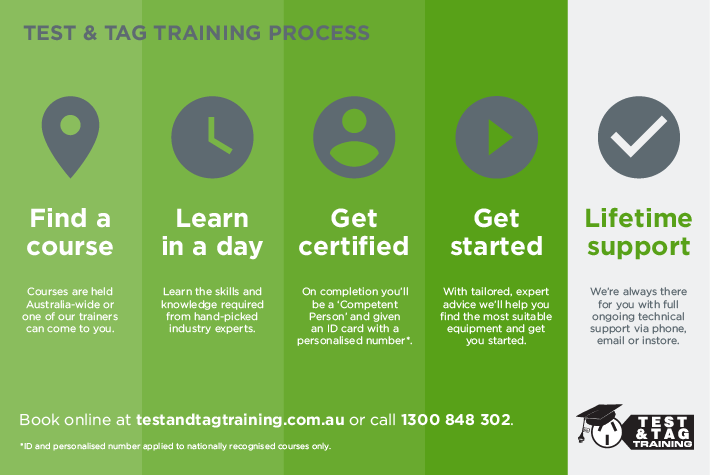 View our infographic on how our test and tag structure works. As a Registered Training Organisation, students that succesfully complete the Nationally Recognised course will be given a Statement of Attainment and ID card with their certification number. Similarly, if you complete the Short course you’ll receive a Certificate of Attendance. If you have more than five people that need training, we can in fact offer a group discount. Please call 1300 848 302 if you would like to discuss training options. Yes, we certainly can! We have provided onsite test and tag training for some of the largest companies in Australia and have worked with hundreds of smaller businesses in a wide variety of industries. If you would like to discuss how we can put together a tailored training option for your company, please contact us.